alaTest has collected and analyzed 2478 reviews of Sony BDP-S6500. The average rating for this product is 4.4/5, compared to an average rating of 4.6/5 for other products in the same category for all reviews. Opinions about the image quality and design are on the whole positive. The size and price also get good comments. There are some mixed comments about the reliability. We analyzed user and expert ratings, product age and more factors. Compared to other products in the same category the Sony BDP-S6500 is awarded an overall alaScore™ of 93/100 = Excellent quality. This flagship Blu-ray performs great with both discs and streamed video content but is the Ultra HD scaling really worth the extra? 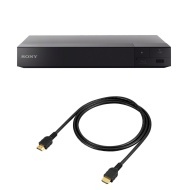 The Sony BDP-S6500 provides excellent video and audio quality and a handful of streaming apps. Premium features like 4K upscaling and 2D to 3D conversion give it added value over entry-level players. You can download an app that lets you use your smartphone as a remote. The built-in apps take a long time to load. With its impressive video and audio quality, connectivity options, and built-in apps, Sony’s BDP-S6500 is a premium Blu-ray player that fits nicely in a home theater setup. The Sony BDP-S6500 Blu-Ray player is a well-specified player, and is now available at a very competitive price. Just about everything you could want is included here, at least until the next generation of UHD Blu-Ray players becomes available in 2016 . A very nice low-cost player. Initial difficulties with Blu Ray sound but eventually solved in Settings by changing the Audio Output from Auto to PCM. Great picture upscaling giving excellent detail. This is the third blu-ray I've had but by far the best Picture/Sound of all and so easy to use super still pictures (no fussing or jumping) just crystal clear.yes I would recommend this Blue-ray player and give it 5 stars.